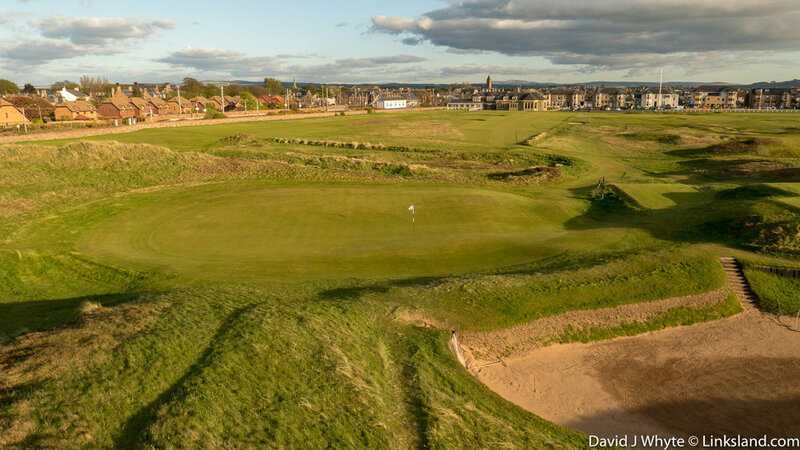 In the mid 19th century, Old Tom Morris was instrumental in establishing some of the first golf courses in Scotland’s Southwest finding there was plenty links terrain ideally suited for the game. Now, Ayrshire has some of the best links golf courses in Scotland with no less than three Open Championship venues and a host of other superior seaside options. On the 17th of October 1860, Old Tom Morris invited a group of contemporaries; golf professionals from the east of the country to participate in an ‘Open’ tournament event. Eight showed up to play three consecutive rounds (in a day) on Prestwick’s 12-hole course! It was a start! The 17th at Old Prestwick, the original 2nd hole from Old Tom’s 1851 layout and the oldest existing hole in championship golf. Young Tom Morris won the Open Championship four times in a row at Prestwick by the age of 21. No one has repeated this singular feat since! Today, Southwest Scotland boasts no less than three Open Championship venues along with a host of superb supporting courses - to say nothing of the castles and cultural encounters that we have carefully curated for our Southwest Scotland tour. Sumptuous 13th century Rowallan Castle is one of our most comfortable accommodation options alongside the 16th century ‘New’ Castle surrounded by its own 18-hole golf course. If you fly into Prestwick Airport or indeed take the train from Glasgow, the overriding impression is the sheer abundance of golf courses along the coast. Royal Troon, Old Prestwick, Dundonald, Western & Glasgow Gailes are just a few of the links in this redoubtable chain and they are all available within minutes of our stately Ayrshire abode. King Robert the Bruce’s castle was positioned on the promontory of Turnberry Lighthouse, now luxurious apartments available to Linksland’s guests. Further south, Robert the Bruce, the hero king who led Scotland to victory during the First War of Scottish Independence hailed from this area and the fragmentary ruins of his family castle remain cheek-by-jowl to Turnberry Lighthouse and Trump Turnberry’s Ailsa course. Nearby is Culzean Castle with its luxury apartment gifted to President Eisenhower in recognition of his role in the Second World War - in which you are invited to stay. The Par 3, 11th at Trump Turnberry, one of several completely redesigned holes on the Ailsa Course that have reinvigorated this exceptional Open Championship venue. Nearby, 18th-century Dumfries House, saved at the 11th hour by HRH Prince Charles is set in a 2,000 acre estate and offering an unrivalled collection of Chippendale furniture and art. You are invited to an exclusive, welcome reception & tour followed by a wonderful dinner in the Great Stewards Dining Room, a truly unique, private experience! You don’t come to Southwest Scotland and not rub shoulders with Robert Burns! Our national bard might have existed more than two centuries ago but his sentiments go on forever. And there is no better place to encounter his life-aspiring writings and catch a glimpse of his unique talent than in Alloway, the town of his birth. In 1779, the adolescent Robert Burns attended dancing lessons in Tarbolton, most likely looking for the opportunity to meet young ladies. His dance teacher William Gregg played this fiddle while Robert learned the steps. Within a square mile, The Robert Burns Birthplace Museum brings together many aspects of Scotland’s favourite son’s early life; The Burns Cottage where he lived until the age of seven, Burns Monument & Gardens, Brig o' Doon, the 15th-century cobblestone bridge over the River Doon, the Auld Kirk where the poet’s father and sister are buried and the Museum itself where you will encounter his words, his keepsakes and objects that connect you with the man and his world. Next to the Burns Museum is Brig o’ Doon, the inspiration for the 1950s movie and Broadway musical ‘Brigadoon’ centred around a magical Scottish village that appears through the mist every hundred years - and only for a day. Modern visitors frequently ask when the next appearance is due! The ‘Auld Brig’ was also the setting for Burn’s poem, Tam o' Shanter where the intoxicated Tam is chased on horseback by a witch. Interestingly, a line in the cobbles of the bridge is cranked due to the belief that this pattern would stop witches from crossing. One of the best aspects of Southwest Scotland is its close proximity to the City of Glasgow, its airports, art galleries and eventful nightlife. Within an easy half-hour drive, you can be in the centre of town and enjoying the myriad of all that the ‘Second City of the Empire’ offers. Glasgow is full of art: the Gallery of Modern Art, Trongate 103, Tramway, Glasgow School of Art and a ton of independent galleries such as Merchant Gate Gallery, The Hidden Lane Gallery and Compass Gallery. Then there’s the world-renowned Modern Institute and Kelvingrove Art Gallery & Museum, home to Salvador Dali’s Christ of Saint John of the Cross. For dining, Glasgow is consistently voted one of the best ‘foodie’ capitals of the UK with an award-winning array of eateries such as Café Gandolfi, Guy’s, Central Market, Two Fat Ladies and my personal favourite, Rogano which in 1935 was refitted in the same Art Deco style as the Cunard liner 'Queen Mary’ which was then being built on the River Clyde. If you still have any energy, the ‘Second City’ is alive with music; gigs go on most nights of the week at venues such as 13th Note, Nice ‘n’ Sleazy or Maggie Mays. More traditional sounds can be sampled at the Old Fruitmarket or the Royal Concert Hall. The City of Glasgow, over the past 20 years has enjoyed a massive cultural renaissance. Glasgow’s atmosphere can be as chic as Milan or Paris. Sitting outside the many coffee bars or browsing through art galleries scattered throughout the town, the city’s reputation for friendliness is only surpassed by its incisive sense of humour.